Assign seats in style with the S.S. Discover desk nameplates for students. The S.S. Discover desk nameplates provide an easy way to label and organize your classroom. 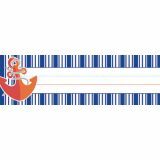 This pack includes 36 desk nameplates—featuring a nautical striped border with anchor accents and measuring 9.5" x 2.875". Nameplates are ideal for making desk or cubby assignments and labeling classroom essentials. With a variety of themes and colors available, Carson-Dellosa's collection of classroom desk nameplates offers something for everyone! To create a cohesive classroom theme, check out more S.S. Discover products. Label classroom essentials with the S.S. Discover collection name tags. 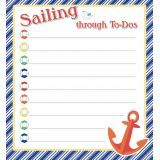 A great organizational resource for a field trip or the classroom, S.S. Discover name tags offer a simple solution for keeping everything labeled. 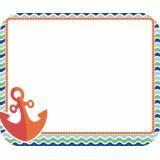 The pack contains 40 self-adhesive name tags—each measures 3" x 2.5" and features a nautical wave border with a red and orange anchor accent. Available in a variety of designs, colors, and themes, Carson-Dellosa's classroom name tags are ideal for open houses, labeling documents, and field trips. Browse other S.S. Discover essentials to create a cohesive classroom. Refresh your stationery with the S.S. Discover collection shaped notepad. With a variety of colors, themes, and shapes, Carson-Dellosa's acid-free and lignin-free notepads provide a fun way to write notes, play games, and create to-do lists. Make sure to view Carson-Dellosa's other S.S. Discover products to create a cohesive classroom theme.